Grilling can bring out the best in many fruits, intensifying the flavors and caramelizing the natural sugars. And they’re not just for dessert: fruit can be incorporated into drinks (Grilled Sangria), appetizers (Bacon-Grilled Dates), and even condiments (Pineapple Salsa). Grilled fruit can play all the roles. Pineapple was the first fruit I ever grilled and it remains a Raichlen family favorite. The key is to grill over a hot fire so you caramelize the sugar while leaving the fruit raw and juicy in the center. In place of the spiced sugar, you can also use my Dessert Rub, which works equally well on grilled peaches, plums, bananas, pears, and apples. This recipe comes from a book we greatly admire, Francis Mallmann’s Seven Fires: Grilling the Argentine Way. The steps may be simple, but the resulting texture and flavors are intense and complex. Kick sangria up a notch by crusting the fruit with sugar and caramelizing it on a screaming hot grill. It’s a smoke and fire twist on a refreshing favorite. 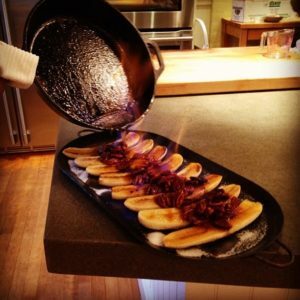 Fruit meets fire in this spectacle of a recipe by using a blowtorch to flambé the dessert tableside. It’s a dish that truly looks as good as it tastes. Baked and sautéed apples are the traditional accompaniment to pork throughout New England. So why not take this traditional combination and turn it into a smoke-roasted appetizer, with a neat presentation on the grill using grill rings? 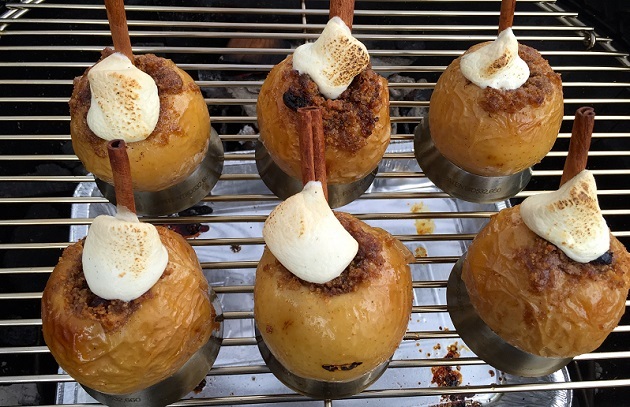 For a more traditional dessert-oriented spin on the baked apple, try these Fire-Roasted Apples. Select fruit that is ripe, but still firm enough to hold its shape when exposed to the searing heat of the grill. My short list of favorites includes apples, apricots, bananas and plantains, fresh figs, mango, papaya, peaches and nectarines, pears, pineapple, plums and pluots. Butter, sugar, and alcohol-based mop sauces tend to spark flare-ups, so maintain a safety zone on your grill where you can move the food to keep it from burning. One super easy, slam-dunk dessert is to brush slices of your favorite fruit (bananas, peaches, pineapples) with melted butter, then sprinkle with sugar and spices like cinnamon, nutmeg, allspice, or my Dessert Rub. Berries (except for large strawberries) are too fragile to grill directly, but make wonderful smoke-roasted crisps and cobblers. Don’t forget about watermelon! Grilling adds a smoky, toffee-like flavor that takes watermelon to another dimension. Grill 1-inch slices over a hot fire (preferably wood or wood-enhanced charcoal), oiling the grill grate well. Serve by itself or drizzle with honey and top with fresh mint and optional crumbled salty cheese, like feta or ricotta salata. 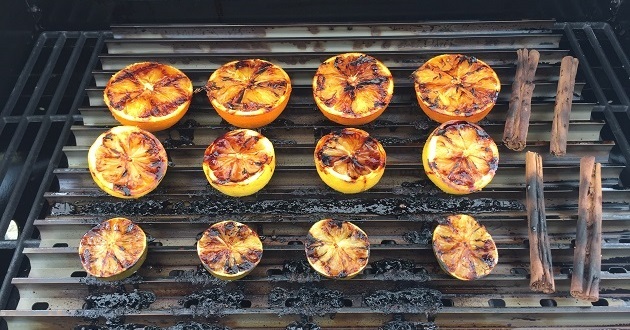 Have a favorite fruit for the grill or technique we should try? Tell us about it by leaving a comment below or on Facebook, Instagram, or Twitter.